Notes: The AS-808 is a digital cable for audio interfaces, DAC, CDJs and all audio-visual equipment. The central conductor is made of 102SSC produced by Oyaide. This core demonstrates an incredible conductivity level of 102.3% IACS (after annealing process). There is a very low level of impurities or signal loss. 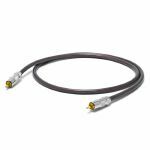 Between the central conductor and polyethylene tube, this cable features an applied air chamber which helps prevent dielectric loss. Oyaide have employed a double-shielding structure which is composed of a copper foil shield (100% shielding ratio) and 102SSC braided shield (90% shielding ratio). The centre pin of RCA plug is a tube structure for maximum surface contact and optimised signal transmission. It is 24K gold plated to prevent corrosion. 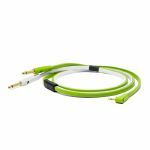 Notes: Since its release, d+classB series has become a world-wide standard cable series for DJs and music producers due to its solid and reliable sound and build quality. In Summer 2018, with a newly-designed 3.5mm stereo angled plug, "d+MYR classB" was developed to meet the needs of existing d+cable users. Notes: Since its release, d+classB series has become a world-wide standard cable series for DJs and music producers due to its solid and reliable sound and build quality. In Summer 2018, with a newly-designed 3.5mm stereo angled plug, "d+MYTS classB" was developed to meet the needs of existing d+cable users. This new option is suitable for gadgets like synthesizers, or tablets/smart-phones, to LINE IN of a DJ mixer for real-time performance with gears, or an audio interface for recording sounds into your DAW sessions, or to powered speakers with 1/4" TS jack Inputs. Notes: The Neo/Oyaide d+ RCA cable is specialized for DJs and designed according to feedbacks of DJs, artists and clubs. By connecting between a DJ mixer and some DJ equipment such as CDJ or PCDJ, you can get a huge improvement in the sound quality. Neo/Oyaide contemplated the best combination of important materials and factors such as structure, conductors, insulators, shielding, outer sheath and contact of plug. As a matter of course, for not only a data compressed file but also WAV, AIFF and CD, the d+ RCA cable contributes to dissolve the stiffness and shallowness of digital sounds. In addition, its hi-definition playback property helps for making a good quality file recording for vinyl sound capturing. Furthermore, although wiring has been regarded as messing up around a booth or a studio, the colorful and innovative product design of d+ RCA cable makes a stylish impression to artists who tend to think that the design is one of the most important factors for their motivation. The Neo/Oyaide d+ RCA cable improves the sound quality of DJ equipments and provides high performance for your DJ playing and sound production. D+ RCA series is specialised for DJs and designed according to feedbacks of DJs, Artists, and Clubs. By connecting between a DJ mixer and some DJ equipments such as CDJ, Traktor and Serato, you can get a huge advantage about the sound quality. Notes: The d+ RCA series is specialized for DJs and designed according to feedbacks of DJs, Artists, and clubs. By connecting between a DJ mixer and some DJ equipments such as CDJ or PCDJ, you can get a huge advantage about the sound quality. About the product planning for the d+ RCA series, Oyaide contemplated the best combination of important materials and factors such as its structure, conductor, insulator, shielding, outer sheath, and contact of plug. As a matter of course, for not only a data compressed file but also WAV, AIFF, and CD, it contributes to dissolve the stiffness and shallowness of digital sounds. In addition, its hi-definition playback property helps for making a good quality file recording for vinyl sound capturing. Notes: Used by artist's such as Dubfire, Richie Hawtin and Carl Craig the d+ RCA series is specialized for DJs and designed according to feedbacks of DJs, Artists, and Clubs. By connecting between a DJ mixer and some DJ equipments such as CDJ, Traktor and Serato, you can get a huge advantage about the sound quality. About the product planning for the d+ RCA series, Neo contemplated the best combination of important materials and factors such as its structure, conductor, insulator, shielding, outer sheath, and contact of plug.As a matter of course, for not only a data compressed file but also WAV, AIFF, and CD, it contributes to dissolve the stiffness and shallowness of digital sounds. In addition, its hi-definition playback property helps for making a good quality file recording for vinyl sound capturing. Notes: Used by artist's such as Dubfire, Richie Hawtin and Carl Craig the d+ RCA series is specialized for DJs and designed according to feedbacks of DJs, Artists, and Clubs. By connecting between a DJ mixer and some DJ equipments such as CDJ, Traktor and Serato, you can get a huge sound quality advantage. Planning for the d+ RCA series, Neo contemplated the best combination of important materials and factors such as its structure, conductor, insulator, shielding, outer sheath, and contact of plug. As a matter of course, for not only a data compressed file but also WAV, AIFF, and CD, it contributes to dissolve the stiffness and shallowness of digital sounds. In addition, its hi-definition playback property helps for making a good quality file recording for vinyl sound capturing. Notes: Multi-purpose high quality RCA to XLR audio cables from Neo by Oyaide. Notes: d+ series bring the highest quality and a cool designed in your sound system such as DJ gears, audio interface, speaker, mixer, effector, synthesizer and all sound gears. About the product planning for the d+ series, we contemplated the best combination of materials and the structure for today's music and situations. You might already have seen d+ class B series somewhere. That's why they always have a desire to improve the sound quality and the cable's transmission influences the total sounds. 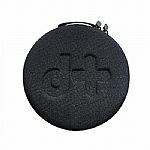 Many professionals are using the d+ series and you can easily get the goodness on your sound system. Notes: Multi-purpose high quality 1/4" TRS to 1/4" TRS audio cables from Neo by Oyaide. Notes: Multi-purpose high quality TRS to TRS audio cables from Neo by Oyaide. Notes: Multi-purpose high quality 1/4" TRS to XLR audio cables from Neo by Oyaide. Notes: Multi-purpose high quality XLR to RCA audio cables from Neo by Oyaide. Notes: Multi-purpose high quality XLR to XLR audio cables from Neo by Oyaide.